Over the last decade, mobile operators globally have grown subscriber numbers substantially, transformed most of those into smartphone users, increased data consumption exponentially, and yet operators' total revenues have hardly advanced at all in recent years. On an inflation-adjusted basis, their revenues have been flat for the last four years. 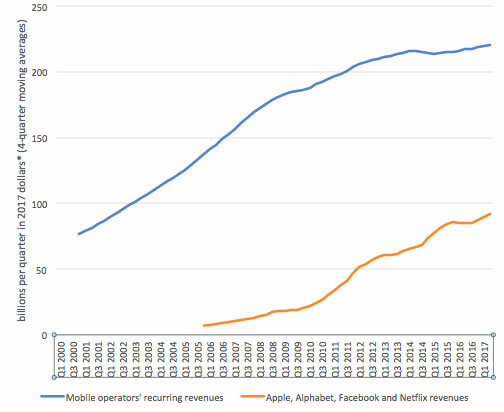 Meanwhile, the tech titans with their Internet-based "digital platforms" have grown handsomely to command a large and fast-increasing proportion of total mobile ecosystem revenues by exploiting cellular connectivity to the capital-intensive network infrastructure and carrier services of more than 800 mobile network operators worldwide. Mobile operator services markets are regulated with spectrum allocations and merger controls that tend to maintain oligopolies including at least three carriers per nation. That is a far cry from an economist's fantasy of "perfect competition" with numerous competitors, but cellular is a highly-capital intensive business with significant economies of scale, regulated requirements to provide wide network coverage and so a significant level of market concentration among operators is more economically efficient. For example, the vast majority of the world's population is covered by several million macro cell sites. These typically cost many tens or hundreds of thousands of dollars apiece. With only three or four nationwide operators, markets are nevertheless generally very competitive, as illustrated by all four major US carriers now offering unlimited data plans. Major investments have been made in new network technologies, most significantly including LTE since 2010, that increase network capacity, improve performance and drive down costs which enables rapid consumer price reductions. ^This is a blended average of recurring revenues for all mobile operator services including voice and data, pay-as-you-go and contract-based including unlimited plans. Figures were derived by dividing inflation-adjusted total operator recurring revenues by total worldwide uplink and downlink traffic (as estimated by Ericsson in Petabytes (10^15 bytes) or Exabytes (10^18 bytes) per month). 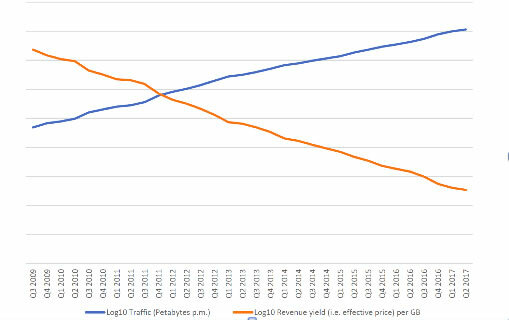 Given the dramatic increases in network traffic, measured in data bytes but also including digitized voice, it is also useful to plot this and the correspondingly rapid reduction in revenues generated per unit of data used on a logarithmic scale. 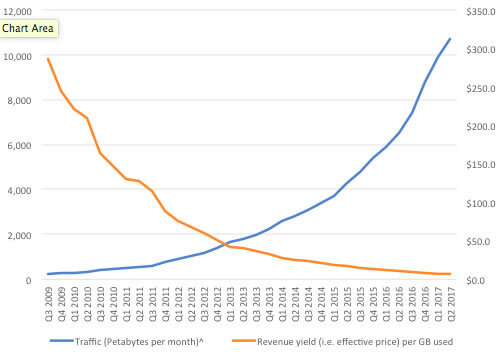 Linearity with similar but opposite gradients in the following log-scale graph illustrates how operators are making no more money despite the massive increase in data consumption. Prices are falling approximately as fast as data volumes are rising. Over-the-top players offering search, navigation, games, social media, video and audio streaming have been enormously valuable in providing good reasons for consumers to pay for data as well as voice and text services on their mobile devices. However, these players are not in enforced national oligopolies like the mobile operators. With large economies of scale and so-called "network effects" that tend to attract most folk to these Internet-based platforms, and with seemingly few barriers to market consolidation, winner may take all and global dominance can ensure for a single company in one or more of these OTT service categories. For example, Alphabet is preeminent in search (Google) and navigation (Google), as well as in 80 percent of smartphone operating systems shipped (Android). The mobile operators are thus being squeezed on both sides - horizontally from peers in national markets that are forbidden further concentration, and vertically from near-monopolists in search, navigation, social media, operating systems. The market power of the latter is exerted in all directions, for example, by Apple as a supplier to consumers and carriers with the tie between its dominant iOS operating system, App Store and its premium-priced devices, as well as with its enormous sway over component vendors and technology licensors. 5G has enormous promise, but it will be a very costly endeavor, particularly for mobile operators as well as for technology suppliers. Cost estimates for 5G vary widely, depending on geographic scope and other assumptions. However, it seems likely that building 5G networks- upon which devices, applications and OTT services will run-will be of the order of a trillion dollars or more globally. That will only be forthcoming if carriers can find ways of driving significant additional revenues from such large investments. Network equipment vendors have also been having a tough time, for example, as illustrated by Ericsson's profit warning last year, because carrier customers have been reluctant to spend with deterioration in demand for mobile broadband equipment. Restoring significant financial growth for mobile operators is as important to the equipment, device and chip vendors in cellular as it is to the operators themselves. As indicated by antitrust economist, Diane Coyle, recently, there is a need for a rethink in competition policy for digital platforms. 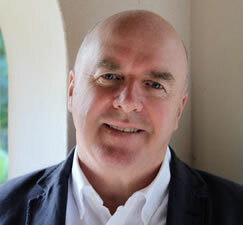 In Coyle's words: "How will investment in physical networks or content get funded if an incumbent using the network and content captures all the profit downstream?" Regulators need new tools to assess the effects of market concentration as digital platforms take large and increasing shares of ecosystem revenues and profits.